DVK 6 pipe couplings with quick closure accelerate mounting in suction conveying with constant safety. 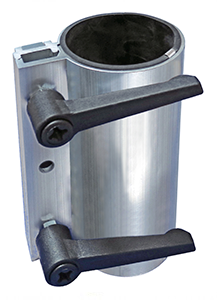 The clamping lever can be locked in any desired position by a simple upward pull. A high clamping force develops due to optimal length of lever. Please note: Similar to DVK-6 pipe couplings there are no welding works necessary. Mounting these pipe couplings is hazard-free and can be done very fast because of quick closure. This type of pipe couplings is not safe for use with liquids.